Kai McCall received his Bachelor of Arts degree from the University of Western Ontario. He is a three-time recipient of Canada Council Grants and has works in numerous private and corporate collections across Canada, the United States, the UK and France. 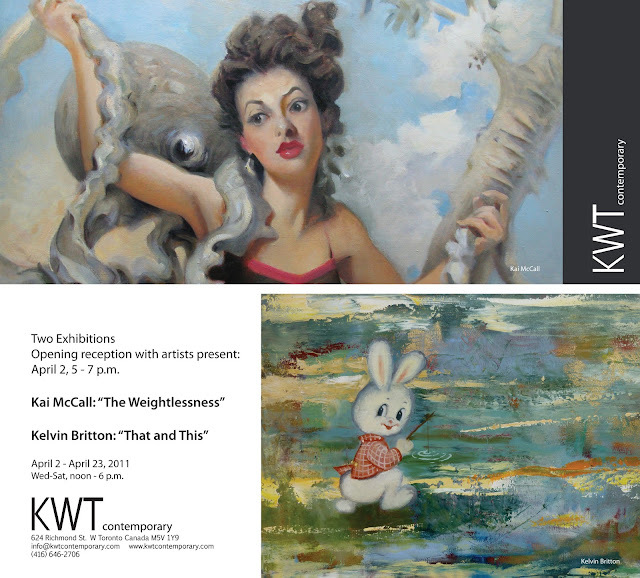 This is his second solo exhibition at KWT contemporary. He is lives and works in Montreal. Kelvin Britton : "That and This"
In his first solo exhibition at KWT contemporary, Britton plays with hi/lo references to icons of 50's visual culture. Vintage toys float, leer, gloat and giggle on gorgeously painted abstract expressionist backgrounds. Britton states: "The act of painting takes the form of a conversation, a unique experience, a journey. A new dialogue is engaged in with each new approach to the work, new layers of discovery are revealed, realms of consciousness, otherwise inaccessible become apparent. The different stages/aspects/ layers of the painting represent a record of a dreamlike encounter. Looking at the evolution of the paintings feels like an archaeological expedition through time and space, through interior and exterior realms, through form and feeling." Kelvin Britton was born at the Covered Wagon Trailer Park in Fort Garry, Manitoba. After studying Philosophy at University of Victoria, he attended Nova Scotia College of Art and Design, where he studied painting under Gerald Ferguson. He lives and works in Toronto.